Department of Biomaterials hosted two seminars on nanostructured biomaterials and biosensor applications based on nanotechnology. Is it possible to build an artificial cell from scratch? Possibly, Irep Gözen has at least made a good start by mimicking the cell membrane using nanoscale bioengineering. End of the academic year brought along two high quality seminars with both international and national guest lectures to give us some scientific inspiration and new ideas for the upcoming year. The first of the two seminars on the new possibilities in biomaterials science made available by the recent advances in bionanotechnology focussed on nanoscale bioengineering. Presentations from Professor Sivashankar Krishnamoorthy from Luxembourg Institute of Science and Technology and Guruprakash Subbiahdoss from Aarhus University introduced us to cell and bacterial adhesion on nanopatterned surfaces and how this can be tested in sequential co-culture assay that mimics the so called 'race to the implant surface' between bacteria and host tissue cells. Similar themes were followed by our local invited guest: Irep Gözen from the Centre for Molecular Medicine Norway introduced us to engineering of artificial biomembranes, while Roger Simm and Kenneth Schneider's talks were more focussed on investigating bacterial adhesion on solid surfaces and means to prevent biofilm formation by altering surface roughness or using antibacterial surface coatings. Professor Oliver Hayden from TUM works with cell diagnostics. We continued discussing the latest technological advances in life science that have been enabled by the recent developments in nanomaterials merely a week later when Professor Oliver Hayden from Technische Universität München and Peyman Mirtaheri from Oslo and Akershus University College of Applied Sciences visited our department to give talks at our biosensor seminar on 1 December. Professor Hayden presented his latest research topics related to investigating magnetic and optical techniques for the functional diagnostics of blood cells in vitro. 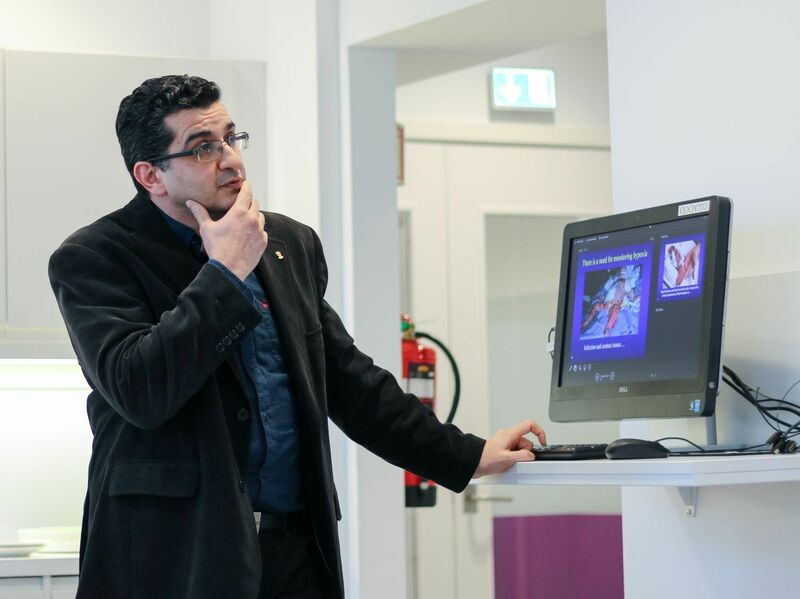 After his presentation, Peyman Mirtaheri moved up a gear and took optical biosensing from in vitro applications to more in vivo based systems by discussing the possibilities of using near-infrared spectroscopy in probing various physiological processes in the body.